Amy and Brandon own a 65,000- square-foot 19th-century factory in Geneva, New York, where they live and run Miles & May Furniture Works. 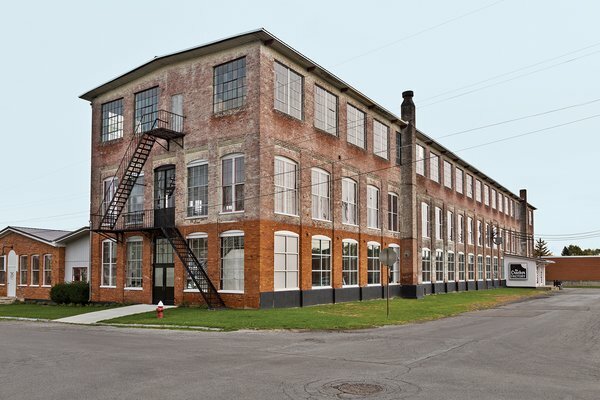 They bought the building in 2007 for $137,500 and have been—with sweat, creativity, and a shoestring budget—steadily rehabbing it from a forlorn relic into a 21st-century factory humming with possibility. 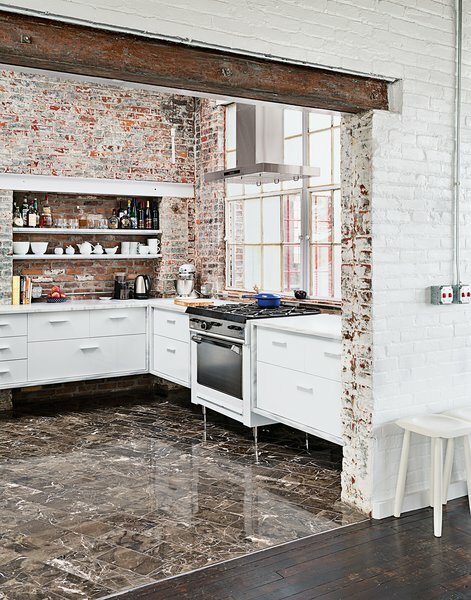 A 19th-century New York factory houses both Brandon and Amy Phillips’s apartment and the workshop for their company, Miles & May Furniture Works. The Cracker Factory (the building’s new name, a pithy moniker that came from a shared love of The Simpsons) stretches over three floors and is anchored on one end by a 200-foot-high smokestack, left over from its previous life. The workshop and showroom occupy the first floor, while the second floor houses the couple’s 1,700-square-foot apartment, a 6,000-square-foot event space, and a 4,000-square-foot letterpress studio. The third floor remains untouched, with plans in place to convert it into artists’ residences. Among the couple’s cost-saving measures was outfitting the kitchen with their own custom cabinetry. The brick and windows are original, the Garland stove was a Craigslist find, and the floor tile was found on closeout at a cost of about $1 per square foot. The couple’s large two-bedroom flat is composed primarily of stained heart-pine floors, mottled worn-brick walls, and enormous metal windows set with blue-and-white safety glass. It’s a testament to the richness of well-placed, delicately finished found materials. The front door opens into their kitchen, where you step onto a glossy, chocolate-marble-tile floor (rejects bought on clearance). The grandeur of this space is kept in check by a simple, original wood skylight hovering 19 feet above. The white veining in the floor is picked up by the white cabinetry—MDF covered in automobile paint—and the Carrara marble counters that appear to wrap the built-ins, inverting and riffing on the typical treatment of stone resting atop. Beneath a recycled-wood ceiling and centered by a Bokhara rug, the living area contains furniture of their own design. The living-dining area, which opens off the kitchen through a nine-by-seven-foot doorway, comprises the bulk of the apartment. One corner of the room holds a hickory dining set from the couple’s furniture line; the other contains the entry to their bathroom, with a sliding door constructed from salvaged, leaded windows and ipe from the Coney Island boardwalk. A large shower takes up the back end of the bathroom, and cleverly installed found objects fill out the space: Electrical boxes serve as medicine cabinets, and wall-hung train luggage racks hold towels. Brandon and Amy set up different workstations in the living area. One continuous cathedral ceiling runs from the kitchen threshold to the back, where the bedrooms are. 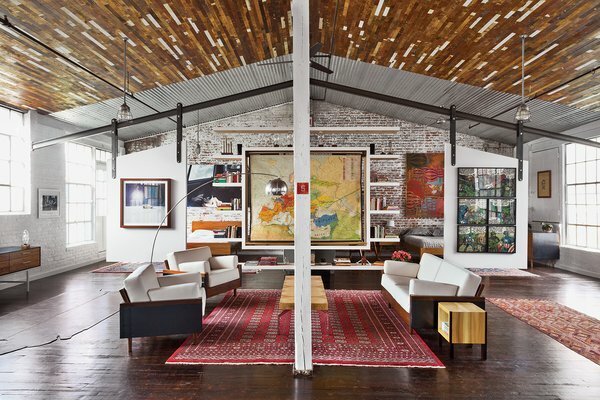 A variegated wood ceiling, fashioned from maple flooring rescued from a factory in Michigan, dominates the open living area and gives way to corrugated metal in one bedroom. A large entertain- ment center, fabricated from salvaged industrial joists, cantilevers off one of the central columns of the loft and physically divides the private and public spaces. The dining area, with a table and hickory chairs from Miles & May, opens onto a kitchen the couple created as part of a DIY gut renovation. The result, says Amy, is an "intentional raw and polished combination." The lamp is from M&M Electrical Surplus. Throughout, the couple has made the reuse of found objects feel purposeful and prized—and far more special than what any museum of America’s industrial past could achieve. "We work 80 hours a week, so we needed to live and work in a beautiful place," says Amy. "Some people like cars. We like space." 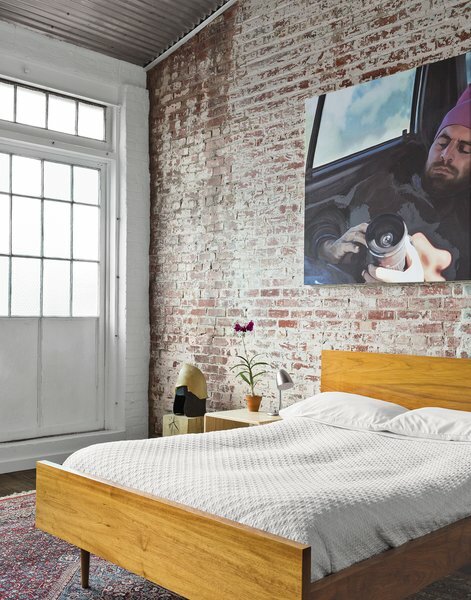 In the guest bedroom, a painting by Monique Crine hangs on the original brick wall above a Miles & May bed and side table. The rug is from ABC Carpet & Home. 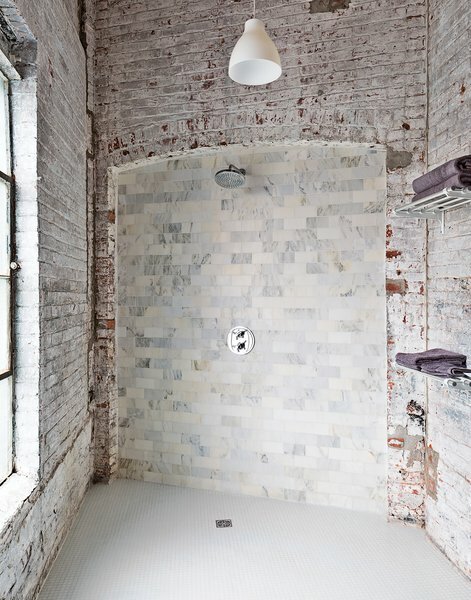 The bathroom evokes the building’s industrial bones. The pendant light is from Ikea, and the towel racks are repurposed train car luggage racks. The Carrara tiles are mismatched seconds. "It works if you let yourself not try to fix it," says Brandon.